There is plenty of excitement this time of year. With the colorful autumn leaves on the ground, football in full swing (Go Seahawks!) and the approaching holidays there is always much anticipation. 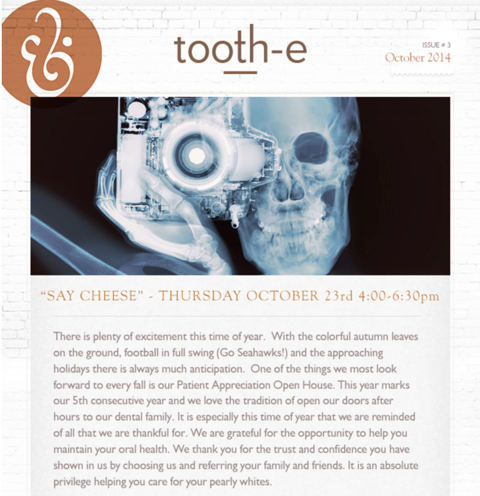 One of the things we most look forward to every fall is our Patient Appreciation Open House. This year marks our 5th consecutive year and we love the tradition of open our doors after hours to our dental family. It is especially this time of year that we are reminded of all that we are thankful for. We are grateful for the opportunity to help you maintain your oral health. We thank you for the trust and confidence you have shown in us by choosing us and referring your family and friends. It is an absolute privilege helping you care for your pearly whites. Come join us and taste some Washington wines with Brix 25 sommelier and sample beer from 7 Sea’s Brewing. Come play games, receive a gift from us and step into our Fliptastic Photo Booth that will allow you to capture your smile in action. Kids, feel free to come in costume! This is an event at your dental office that you won’t want to miss. Prize Donations from local businesses: Bring a friend and your name will be entered twice! We recently had a patient who came in and said he was chewing on duck eggshells to improve their dental health. What???.. When asked WHY he was chewing on duck eggshells the patient replied, "I feel it is sharpening his teeth and making them stronger." Geographic tongue is a harmless condition affecting the upper surface and sides of the tongue. It gets its name from its map-like appearance, and is also known as benign migratory glossitis. These map-like patches often heal in one area and migrate to a different part of the tongue. • In China, in 1498, the first toothbrush with bristles was made, using hair from hogs, horses, and badgers. The first official commercial toothbrush was manufactured in 1938. • “6 is the magic number” It’s the magic number of feet away from your toilet you should store your toothbrush in order to avoid airborne particles from toilet flushing, making their way to your bristles, YUCK! • What’s the object most often choked on by Americans? A toothpick! Wouldn’t it just be easier to floss? We received this recommended reading from a great patient and worthy source! It’s a New York Times Best Seller and is Long-listed for the 2014 National Book Award. Check it out! Did you know we are welcoming new patients? The greatest compliment is a referral and we would love for you to recommend us to your friends and family. We are offering a choice of gift cards in appreciation for every scheduled referral. Thank you for being a part of our dental family.